Yelena York is our featured artist to participate with Soze Gallery for a kids day camp in the park in Los Angeles, CA Aug 7 Sunday. CAMP2E is a not-for-profit art camp in Downtown Los Angeles which helps empower inner-city youth, ages 8-14, by teaching them the fundamentals of art including painting, illustration, and sculpture, and gifting them with quality inspirational guidance by accomplished local and international artists. Toowee Kao, Owner and Director of Soze Gallery and Time to Shine Gallery, is the brains and passion behind CAMP2E. 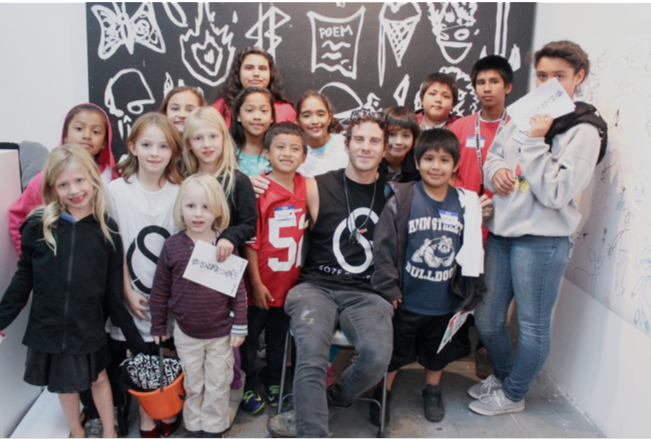 She founded the program in the Fall of 2012 with the help of internationally revered LA- based artist RETNA who ran the first workshop for local children. Guest artists who have donated their time as camp counselors include Pixel Pancho, Jaybo Monk, Ben Frost, DevNgosha and 2501 facilitate workshops. Yelena York Tonoyan, known as York, was born and raised in EasternEurope and currently resides in Los Angeles. York pursued studies in graphic design and photography. Her studies landed her opportunities in art and design. At 24, York established herself as a go tofor interior design. York Armenian and Russian background has given her inspiration for her work. Aside from her culture, York vast love of travel abroad and her knowledge of art history immerse in her pieces. She turned to a different interest with her current collection of mixed media pieces. Her collections of paintings of guns are breathtaking dimensions of colors and 22 karat gold and silver leafs, mostly the technique and quality she uses is being done on iconic statues or paintings of Saints (for Christian or Catholic churches). Yorks work is seen and followed by prominent collectors, celebrities and today contemporary artist. She has shown at Art Basel in Miami, Houston Art Fair, Bridge Art Hampton, LA Mart Art Life,Palm Springs Art Fair, the LA Art Show and many others, including lots of press and Award for Best Artist at the Oxford Art Fair 2015. Yelena York Tonoyan has an inventive character that leads her convey the ordinary entities, shapes and patterns of life to new heights. She is also working on a collection of extremely detailed pen and ink illustrations. Her modernized inspiration earns her artwork the exploration of wealth through black and white. We started a kids camp 4 years ago, CAMP2E. I wanted to help inner city kids in our area learn and participate in art while meeting the international artists we represented at Soze. Every international artist who came to Los Angeles to prepare for their solo show with us would help with a day camp with Soze. The featured artist would speak with the kids on what they did as an artist and the kids would sketch or paint with them. We would have healthy meals for the children, have games for them to participate in. All the kids would leave with a CAMP2E t shirt of the artist who was involved and tote bag filled with art supplies and sketch book. I wanted the children to learn and understand that you can be anything and do whatever you wanted without any boundaries. Connecting them to artists from around the world who were examples of people pursuing their passions was important to me, in order to show the children that they could build from their dreams to become the adults they wanted to be. It was also a way for me to provide the kids with an experience that was outside of their every day lives, to show them a small slice of the big world that was out there. For the artists, it was a great way to connect with the local community and to pass on the things that they have learned over time to the next generation. The arts programs in school are underfunded and underappreciated. I just wanted to help the children of our future learn that anything is possible. The 1st artist who participated was Marquis Lewis, Retna in October Halloween 2012. CAMP2E is a not-for-profit art camp in Downtown Los Angeles which helps empower inner-city youth, ages 8-14, by teaching them the fundamentals of art including painting, illustration, and sculpture, and gifting them with quality inspirational guidance by accomplished local and international artists. Toowee Kao, Owner and Director of Soze Gallery and Time to Shine Gallery, is the brains and passion behind CAMP2E. She founded the program in the Fall of 2012 with the help of internationally revered LA- based artist RETNA who ran the first workshop for local children. Guest artists who have donated their time as camp counselors include Pixel Pancho, Jaybo Monk, devNgosha and 2501 facilitate workshops.